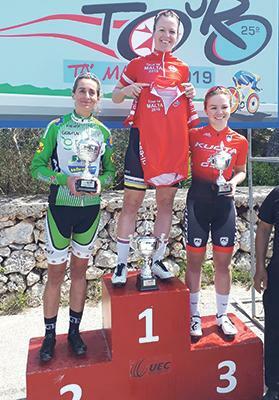 Maltese cyclist Marie Claire Aquilina of Team Greens fell short in her bid to win the Tour ta’ Malta Ladies Category after she was pipped for top spot by Madeline Scott for just a few seconds in yesterday’s fourth and final stage. Marie Claire Aquilina (left) placed second in the overall classification. This meant that Aquilina finished second overall behind Samantha Fawcett of Lovelo Squadra with just milliseconds of difference. The third stage was held at the San Martin Circuit, one of the toughest courses on our islands. The female cyclists undertook the course for six laps, like the Juniors and Masters Categories. Aquilina was determined to make up for her time lost in Saturday’s stage and had a remarkable race, placing second. TW1 Racing Team’s representative Gabriella Nordin completed yesterday’s podium, finishing fourth, however, in the overall lead. Meanwhile, no Maltese came close to challenge for the Elite Category overall lead’s top spot as David Reece placed first ahead of Declan Hudson and Harry Horsman. Both Reece and Hudson form part of the Stuart Hall Cycling Gett. Matthew Dobbing who finished fourth in the overall classification, won yesterday’s 10-lap stage followed Reece and Horsman. Malta’s Christian Formosa was denied a podium place for just a few milliseconds as he ended fourth. Positive news for Maltese cyclists came in the Masters and Juniors categories. Etienne Bonello of Team Greens finished second in the fourth stage in the Masters Category, behind Colin Sturgess. Darryl Maffey of CC London topped the overall classification. Meanwhile, youngster Luke Borg who represented The Cyclist, underlined his dominance in the Juniors event as he chalked up his fourth straight win to claim the overall title. The Cyclist Tour ta’ Malta organisers would like to thank main sponsor The Cyclist for his support as well as the Malta Police Force as well as local councils and authorities who supported this initiative all the way.